Brown the hamburger in dutch oven over 375 degree heat for Frying. Drain excess grease from dutch oven. Chop the onion and add to hamburger. Pour in undrained cans of tomatoes, corn, and beans. Pour in dry taco mix and dressing mix. Bring to boil, mixing occasionally. Lower heat to 225 degrees and Simmer for 20 minutes. Serve into bowls, sprinkling cheese and chips on top. 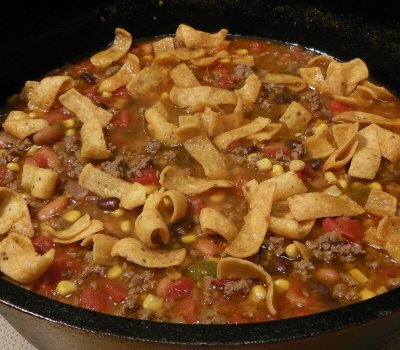 Let me know how you enjoyed your Taco Soup!